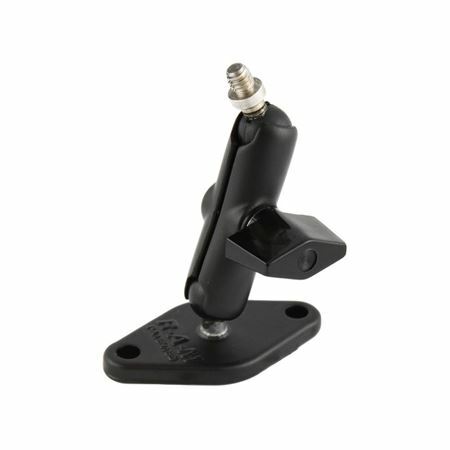 The RAM-B-101AU by RAM Mounts consists of a double socket arm, one 2.5" diameter round base with the universal AMPS hole pattern and universal camera/camcorder base. The universal camera/camcorder base consists of a 1" diameter rubber ball connected to a 2.5" diameter round base with 1/4-20 camera thread. The male thread matches most standard camera and camcorder female threads found on the bottom of the camera. Rubber ball, socket technology dampens shock and vibration, as well as allows for almost infinite adjustment, perfect viewing angles.